For the very best value we can offer you at East Midlands airport you'll want to book one of our East Midlands off-airport parking packages. 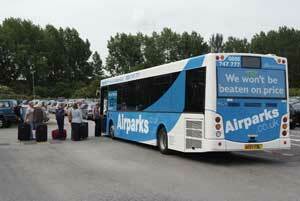 Airparks East Midlands is our only off-airport car park at East Midlands. Not only is it great value but the transfer from its excellent location just over two miles from the terminal is both quick and easy. An off-airport car park is simply one that lies outside the airport grounds. On-airport parking is within the grounds and tends to be more expensive. The great thing about Airparks East Midlands is it has the best of both worlds. Its so close to the terminal, that transfer times are not much longer than those from on-airport car parks but the cost of parking is considerably cheaper. Airparks is eight minutes from the terminal - that's the same transfer time as East Midlands Long Stay car park 7 and only two minutes longer than car park 6, both of which are on-airport car parks. Why book off-airport parking with Holiday Extras? Airparks East Midlands is almost always our best value car park at East Midlands airport and you can often get a much better price by booking in advance. If you pay on the day the price could be almost double what you'd pay if you booked in advance with us. We're confident that we're Never Beaten on Price - if you find the same Airparks package on sale elsewhere for less, we'll refund the difference. You can leave your vehicle at Airparks East Midlands happy in the knowledge that its safe. The car park is fully secured and holds the Park Mark®, a national security award accredited by the Association of Chief Police Officers. It's patrolled 24 hours a day and protected by CCTV, floodlighting, a fence and entry and exit barriers. As an added bonus we include transfers in the price. These run every 25 minutes, 24 hours a day and all the buses are wheelchair-accessible. There are two packages to choose from at Airparks - the ordinary Park and Ride package, where you get the transfer bus to the airport and back, or the Return Greet service, where your car is brought to the terminal for you when you return from holiday, allowing you to begin your journey home sooner.